LIMA — While Kosovo and the United States may be half a world apart, both require political influencers to stand 100 feet away from the polls during Election Day. 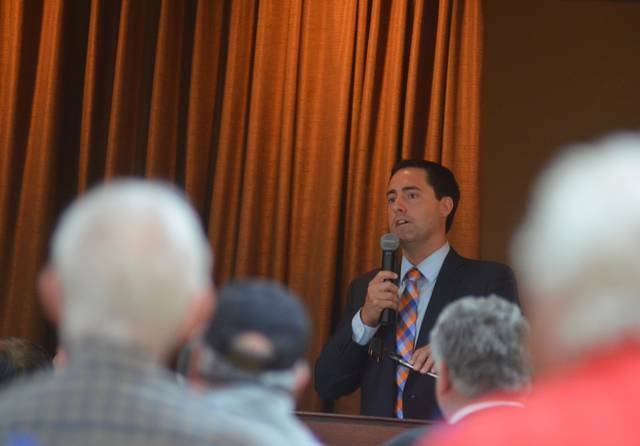 During a visit to the monthly Allen County Republican Party luncheon, Secretary of State candidate Frank LaRose, R-Akron, recalled a moment when he watched an elderly Kosovan woman struggle up a steep hill in order to vote. Due to the 100-foot setback and his role as an American soldier at the time, he stayed an observer, but her dogged approach exemplified a faith in elections that many American citizens have lost when it comes to voting in today’s political landscape, he said. As Ohio’s Secretary of State, LaRose said he would help restore that faith by increasing transparency of campaign finances, ensuring fair redistricting, updating county record systems and boosting civic education. While conservatives and liberals often agree that elections need to be fair, the divide often lies in the reason why elections are deemed unfair, with conservatives claiming fraud and liberals claiming suppression. LaRose said that kind of talk is “irresponsible for both parties to spread that sort of thing,” and instead, thoughtful discussion should be encouraged. Some initiatives LaRose is planning to follow if elected include better tracking what’s known as “dark money,” or funds donated to candidates through subsidiaries, making county candidate funds more searchable, putting absentee ballots online and, in the long run, finding ways to educate the next generation about its civic duty. Outside of running elections, Ohio’s Secretary of State also sets up how individuals register businesses with the state. LaRose said he would use those duties to streamline the process and encourage regulatory reform. “Entrepreneurship is what built this country, and if I get to be the person that gets to welcome new businesses to the state of Ohio, I’m going to take that role on as an advocate for small business,” LaRose said. In order to do so, LaRose said he would like to cut duplicate business regulations, change how administrative fines are used by the state government and use new digital technologies to change how Ohio secures information. In the future, LaRose would also like to establish business courts within each of Ohio’s 12 court districts that would work exclusively with business-related court cases, he said. Judges elected to oversee such courts would have business experience in the same way that many judges have backgrounds working on criminal cases.